Whether from snow, rain, or your own sweat, gear often ends up wet after big days spent playing and working outside. Without a forced-air drying solution, the enclosed spaces in boots and gloves can remain damp for days on end. And wet gear is cold gear. 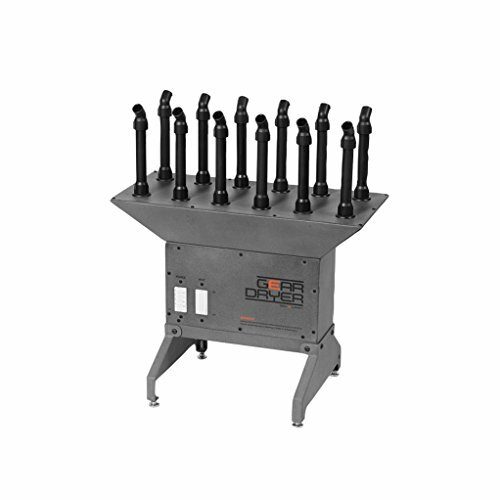 The GearDryer Freestanding 12 Port Boot and Glove Dryer delivers more than 200 CFM of forced airflow-heated or ambient-to quickly evaporate and remove the moisture, allowing you to start every day dry and stay warm. Whether you're skiing fresh powder, riding snowmobiles, working tough job sites, playing hockey, or dealing with sweaty sports shoes in the summer-GearDryer is the ultimate boot, shoe, glove, and gear drying solution. If you have any questions about this product by GEAR DRYER DRY = WARM, contact us by completing and submitting the form below. If you are looking for a specif part number, please include it with your message.